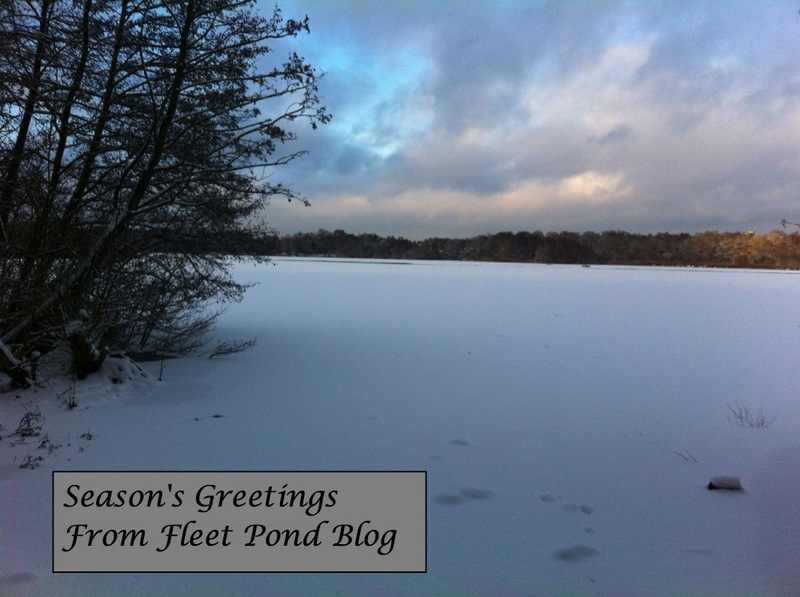 Many thanks for the interest you’ve shown in Fleet Pond Blog this year. We’ve been fortunate in having had over 164,000 visits since it started in July 2008! There’s still three weeks left to go through your photos and decide which may be good entries to send in (theme is ‘Seasons’) as well as a few weekends to go round the Pond and capture that special picture! The famous Brooks Fleet Pre-London Half Marathon will take place on Sunday 19th March 2017, starting at 10:30. Why not put watching this event into your diary, it’s very impressive and has a great atmosphere! 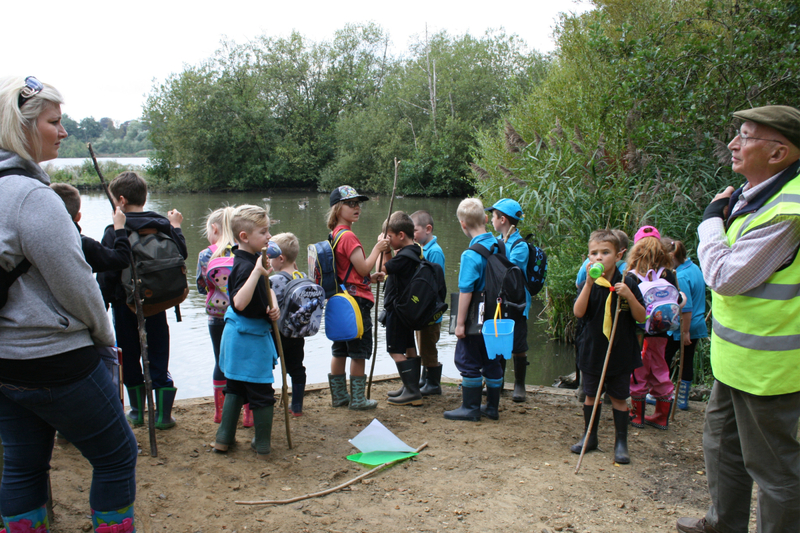 New local charity – Fleet Pond Society – helping to support the natural environment in Fleet. Run for them and make a difference. Brooks event t-shirt available to buy when you enter the race. Medal, re-useable kitbag and other gift for all finishers. More toilets within the park following runner feedback. New race partner ‘Everyone Active’ the management company of the new Hart Leisure Centre opening March 2017.
and we all wish them well in their preparations for the demanding event next year. We also have 5 free places left – why not run for Fleet Pond? If you are interested please drop a line to our Chairman, Colin Gray at chairman@fleetpond.org.uk or phone 01252 616183. We will publish further details nearer the time, including relevant charity giving pages. FPS will be providing several stewards for the race and will also have a gazebo at the finish at Calthorpe Park Race Village. Please call by on the day if you’d like some information on how FPS benefits the local community. FPS have been involved with this event previously. In 2015, two runners from Mackenzie Smith Estate Agency, Roxanne Lewington and Tara Skinner, raised £559 for the Pond by participating in the Half Marathon, see here and picture below. 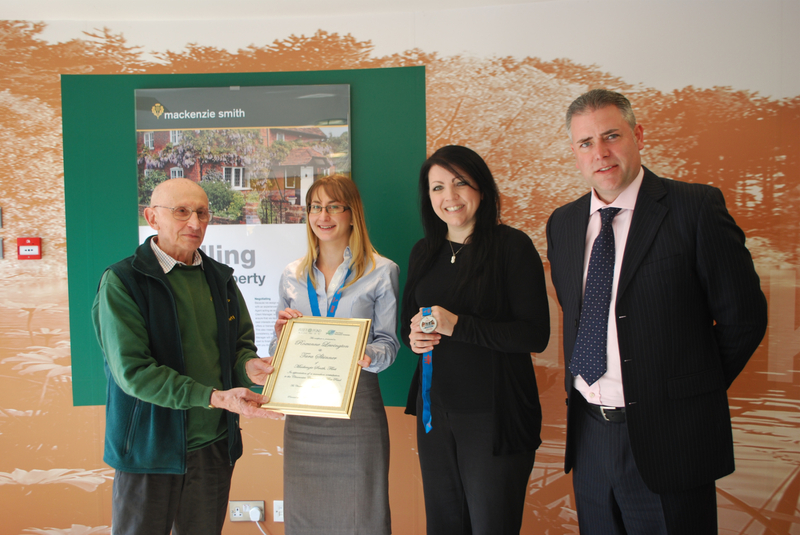 “Last month Michael Thompson and I went to the Rushmoor Volunteer Recognition event at the Rushmoor Council Offices. 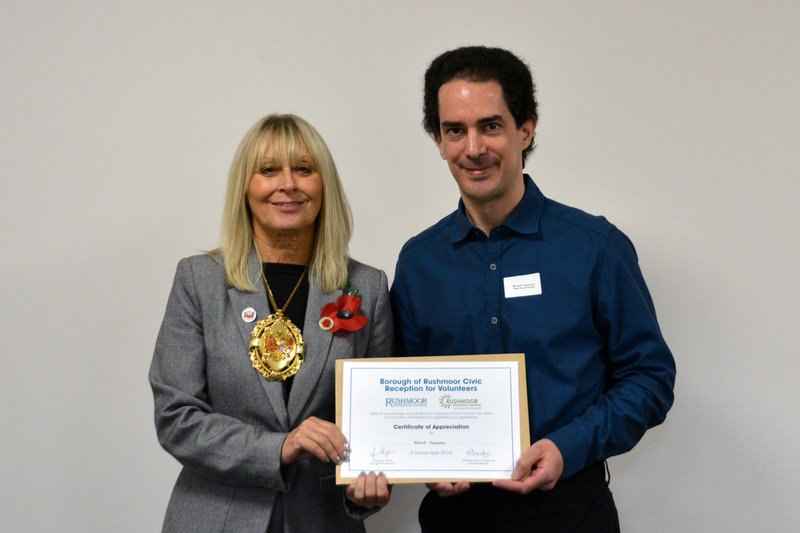 Michael was presented with a certificate by the Mayor of Rushmoor Jacquie Vosper for his many and varied volunteering activities with Fleet Pond Society. Rushmoor has a rich tradition of voluntary organisations supporting our community. Volunteers are the life-blood of local projects, organisations and charities. The Celebration Event was held at the offices of Rushmoor Borough Council on Wednesday 9th November 2016 from 12:00 pm to 1.30pm in the company of the Mayor of Rushmoor, Jacquie Vosper. At this event Voluntary Organisations had nominated a volunteer to attend the lunch with a guest to receive a certificate from the Mayor in recognition of their volunteering activities. “Our task for the coming Sunday is an attack on birch and a coppicing of gorse up on the Dry Heath adjacent to the reserve car park. Assemble as usual at the Countryside Workshop at 9.00 for a 9.15 a. m. start. The soil will not be as muddy but could be wet underfoot so waterproof boots recommended. 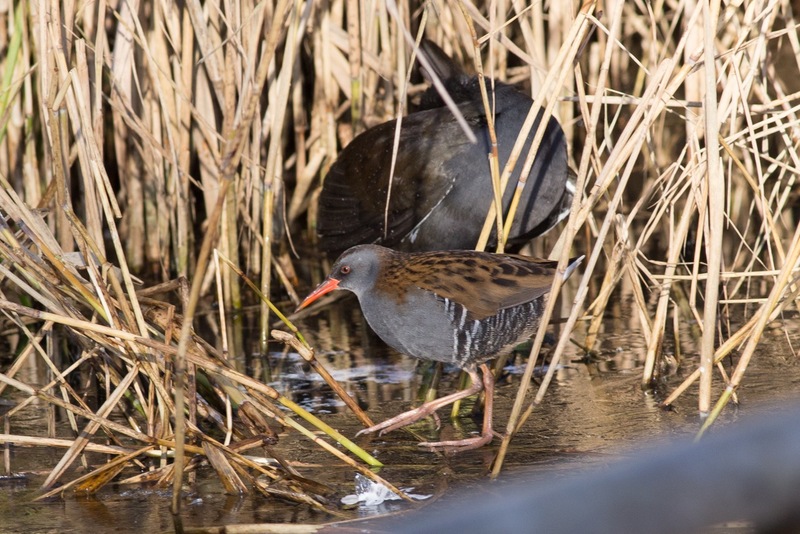 Local photographer John Sutton grabbed this impressive snap of a water rail on the Pond during the recent icy weather. This is a very secretive bird that lives deep in the reedbeds from most of the year, but emerges into the open when the pond is frozen over. You can get a good idea of its size by the moorhen just behind it! Further information on the Water Rail here. Earlier this year, a warning was given of the presence of harmful algal blooms at Fleet Pond (see here). We are happy to say that the blue green algae has now gone from the Pond as confirmed by the Environment Agency last month. You are currently browsing the Fleet Pond Blog blog archives for December, 2016.